Hailed as “one of the most interesting and accomplished conductors of his generation,” Julien Benichou is noted for his blend of flexibility and control, inspiring musicality and incredibly infectious energy. Benichou currently serves as Music Director for the Mid-Atlantic Symphony Orchestra (MSO), and was recently appointed Principal Conductor of the Washington Opera Society. He is also the Music Director of the Chesapeake Youth Symphony Orchestra (CYSO) and the Southern Maryland Youth Symphony Orchestra (SMYOC). This past December, he made his debut with the New York City Ballet, in Balanchine’s The Nutcracker, and returned to Carnegie Hall, in a concert that featured Robert Redford and Vice-President Al Gore. As Music Director of the MSO for the last 12 seasons, Benichou has greatly raised the profile of the ensemble, attracting premier artists, as well as expanding the orchestra’s season. This year, he collaborates with Stefan Jackiw, Virgil Boutellis-Taft, Kurt Nikkanen, Brandie Sutton and Leon Fleisher. Previous seasons have included concerts with such noted artists as Kevin Short, Lester Lynch, Arnaud Sussmann and Tine Thing Helseth. Served by a keen attention to detail and an ability to bring forth a wealth of expression from singers, Benichou has also found success conducting operatic productions. 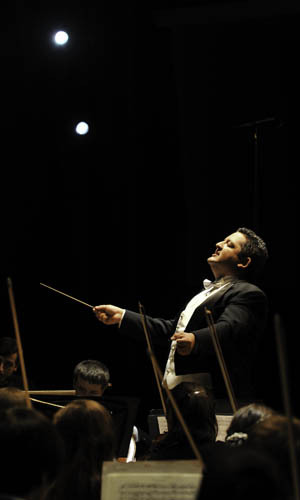 Most recently, as principal conductor of Washington Opera Society, he conducted La Cenerentola at the French Embassy, and L’elisir d’amore at the Residence of the Ambassador to Colombia. This June, he will conduct their production of Carmen with Jonathan Tetelman as Don José. He has conducted, to great critical acclaim, fully staged performances of Gershwin’s Porgy and Bess with the Morgan State University Choir and Opera Workshop. In September of 2016 he conducted the premiere performance of James Lee’s Mother’s Lament with the Morgan State University Choir. Benichou has also garnered acclaim as guest conductor at the Annapolis Symphony, Newark Symphony, Ballet Theatre of Maryland, Baltimore Concert Opera, Baltimore Symphony/Mobtown Modern Synchronicity projects, Orquestra Sinfonica do Parana in Curitaba, Brazil, the St. Petersburg State Symphony in Russia, the Maison Symphonique de Montreal in Canada, and the Siberian State Symphony in Krasnoyarsk, Russia, where he will return next season. Other return engagements will include a collaboration with Tim Janis at Carnegie Hall. An avid supporter of new music, Benichou collaborated with many composers and was the Principal Conductor of the Towson New Music Ensemble for ten seasons. He also served as principal conductor for the Mobtown Modern Ensemble. Also a composer, Benichou has received commissions for theater, film and concert music; most recently from the Siberian State Symphony Orchestra. Benichou has taken the Chesapeake Youth Orchestra on six different European tours, performing side-by-side concerts with the Orchestre des Jeunes de Montréal and the St. Petersburg State Symphony. He also brought the orchestra to prestigious venues such as Carnegie Hall. The orchestra has been invited by several festivals in France, with an upcoming tour where they will premiere Lalo Schifrin’s Mandolin Concerto with Vincent Beer-Demander. Julien Benichou also enjoys crossover and pops concerts, and has worked with The US Army Blues Big Band, the Army Strings, the Irish band Lunasa, and such artists as Warren Wolf, Mairead Nesbitt, Loreena McKennitt, Sarah McLachlan, and Matthew Morrison. Benichou received a Graduate Performance Diploma from The Peabody Institute and earned a Master’s Degree from Northwestern University. He also pursued graduate studies at Yale University. In master classes he has worked with Leonard Slatkin, Yuri Temirkanov, Marin Alsop, Michael Tilson Thomas and JoAnn Falletta. His main teachers have been Victor Yampolsky, Gustav Meier and Jorma Panula. Before coming to the United States, he trained in France, with Roland Hayrabedian and Pol Mule at the Marseille Conservatory and Jean Sébastien Bereau at the Rueil-Malmaison Conservatory, as well as privately with Yves Cohen. He also studied harmony and counterpoint with Pierre Doury at the Schola Cantorum in Paris.